We are happy that you are interested in a volunteer opportunity with Alpha Sigma Alpha. Please complete the following information. Please specify how much time you are willing to commit to volunteering per week. From the options listed below, please select three volunteer opportunities for which you are most interested in serving. Are you in contact with a chapter? 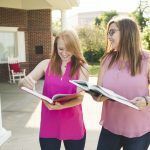 How did you find out about volunteering for Alpha Sigma Alpha?